Which supermarket was the cheapest in 2018? Morrisons is the cheapest supermarket for the second year in a row, with a basket of branded items costing an average of £156.46 across the year in 2018. The same basket of groceries – which includes Andrex toilet roll, Cathedral City cheddar cheese, Hovis bread and PG Tips tea – costs an average of £170.79 at Waitrose, making it the most expensive supermarket for the third year in a row. The same average basket cost £14.33 more than if you’d done the shop at Morrisons. Online-only supermarket Ocado took second place for the most expensive basket, coming in at £169.86 on average. Asda just missed out on the cheapest spot, with an average basket costing £157.99. We also looked at the data for each month in 2018. While the rankings change slightly each month, Morrisons was still the cheapest for six months of the year. Waitrose and Ocado were the most expensive places to buy our basket of groceries for six months of the year each. We quiz thousands of shoppers every year to discover what they really think of the supermarkets they shop in. 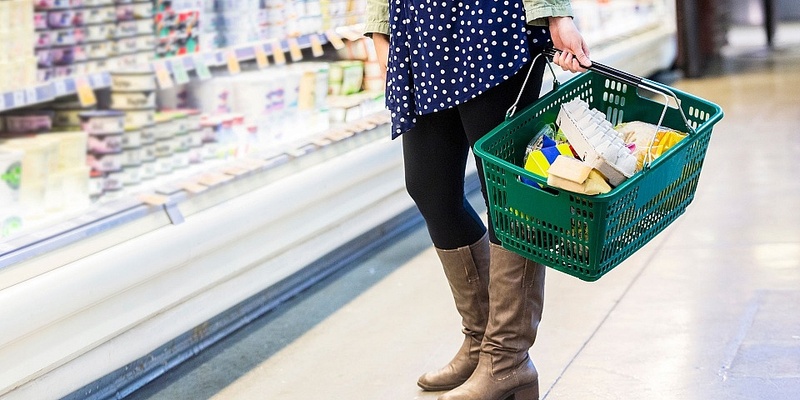 Find out which were rated the best and worst supermarkets. 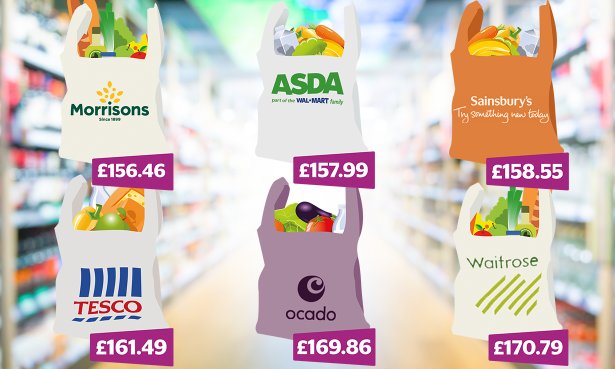 We tracked the prices of 77 popular products sold in the six online supermarkets covered by the comparison: Asda, Morrisons, Ocado, Sainsbury’s, Tesco and Waitrose. Using data from the independent shopping website MySupermarket, we calculated the average price (including discounts, but not multibuys) for each item across the whole of 2018. We added those individual averages up to get the cost of the basket at each shop for each month, and then took an average of those for the whole year. Christmas sales boost: According to data from Kantar Worldpanel, supermarkets posted record sales of £29.3bn during the 12 weeks leading up to Christmas, totalling an extra £450 million compared with the same period in 2017. Saturday 22 December proved to be the busiest shopping day of the year: more than half of all households visited a supermarket in a last-minute Christmas dash. Households racked up an average bill of £383 on their December food shops. Seasonal confectionery hit the mark with shoppers – with sales rising by 7% – but our recent research reveals exactly what’s in the perfect chocolate tin, and how you might not be getting what you expect. Non-alcoholic beer and Christmas puddings clocked in sales of £7.6m and £40.8m respectively, while whole turkeys fell out of favour and experienced a drop of 7% as some shoppers opted for smaller joints, such as crowns, possibly in a bid to crack down on endless leftovers. Asda and Sainsbury’s merger: In April 2018, Asda and Sainsbury’s confirmed plans to merge. The merger is currently in review by the Competition and Markets Authority (CMA), and a decision is expected in February.